just enter facebook in google trends and you will understand. This is not completely correct. Lots of those graphs are based in indices. Which means that not the absolute values are shown. You can only use this kind of graphs to get a grasp of the trend. It's a fact that there is an upwards trend in the amount of search queries (and besides that, the use of more keywords used in a query). 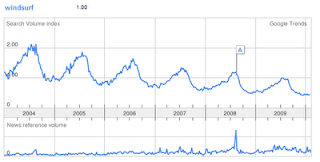 If the amount of windsurfing queries is still the same, you will see a downwards trend. And that's what you will see for a lot of keywords lately. It doesn't exactly mean that there are less windsurfing related search queries. I believe also windsurfing is not increasing or decreasing at this moment still an interesting graph with lots of information!?! And it is an interesting graph for sure.